When in doubt, make spreadsheets! Being the math nerd that I am, I always like to look at things in terms of hard numbers. I'm not a brain scientist, or a psychologist, or even anything more than an amateur observer of human nature, but it has always been my experience that our perceptions are often misleading, and that often the best way to get to the root of any quantifiable problem is to draw yourself a chart. In Faction War especially, there is a lot of things going on with numbers. You have Warzone Control Tiers, and System Upgrades. You have Payout Amounts, Bonuses, Taxes, and Discounts. Any one aspect may seem relatively simple, and make total sense. However, when you look at it mathematically in terms of how it affects and connects with other things, it could show a much different picture, or result then you expected. Without further ado, I will jump right in. First, I'm going to tell you what my base line is, or the general assumptions I use in a lot of my equations. In general, most of my estimates tend to be very low. I'm assuming that plexing a system from 0 to 100% contestation takes 150 plexes. (3,000 VP to take a system at 20 VP given per plex.) This is the minimum number it would take, as systems that are defended will require more offensive plexes to be taken to counter defensive efforts. I'm assuming that an even number of Minor, Standard, and Major plexes are run out of these 150, and that the average Base LP for plexing is 17,500. I'm basing my LP to ISK ratios on a baseline of 45,000 LP for 55,000,000 million ISK in a standard priced store. Other assumptions in specific scenarios will be given. I refer to Pre-Inferno Mechanics as FW 1.0, Post-Inferno as FW 2.0, and Post-Winter-Release as FW 3.0. At first glance, the new payout system in FW 3.0 may look like a significant nerf. However, when running FW 2.0 numbers against FW 3.0 numbers, and comparing ISK per hour income rates, we can see a much more complicated story unfolding. 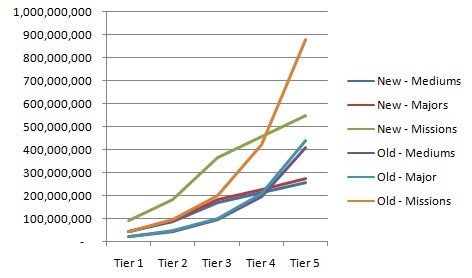 The following graph shows comparisons of income amounts between Standard and Major Plexes, as well as Mission Running in Faction War. Every Tier, up until Tier 4 will have ISK per hour increased, and Tier 5's ISK per Hour will be reduced significantly. 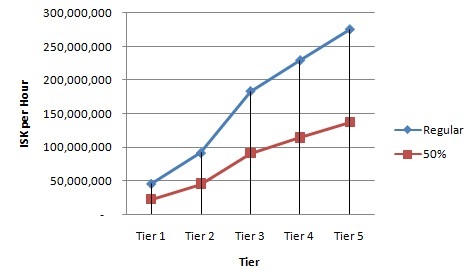 In taking the average incomes across all five tiers, we can see that the buff to the first four Tiers is greater than the nerf to Tier 5. So, with each warzone having a combination of tiers (one militia having 5, vs their opponent having 1, or 2 and 4, etc.) the overall average income of Faction War pilots will increase, but not significantly. In fact, in looking at average incomes over a variety of venues, I found that the increase overall was less than 1%. In many ways, you can think of it as a chunk of 'Tier 5' income being taken away and spread out amongst the other 4 Tiers. While the new payout system is a direct nerfing of Tier 5 income, it is not a nerf of overall FW income. Average income across all five Tiers will remain the same, or increase by a fraction of a percentage. The second major change was to the LP required to upgrade I-HUBs. CCP Ytterbium discusses a need for diminishing returns across the warzone, as well as the need to prevent Tier spiking. To facilitate this, they are proposing a significant increase in I-HUB LP requirement, as well as significant taxes for militias with higher Tiers. Taking this 'tax' into consideration, I calculated out exactly how much it would cost to upgrade to each Tier with a minimum number of systems. (The more systems you have in general, the cheaper it is to upgrade to any given tier. This comes from the aspect that it's more expensive to upgrade from 4 to 5 vs 3 to 4, so more systems give you the ability to upgrade less systems at higher levels. For more details about this math, you can read the post here.) However, for simplicity sake in this post, I've simply used minimum systems requirements. Obviously, it costs significantly more LP to upgrade. However, what does this mean in terms of ISK? When looking at the LP to ISK ratio, how much more expensive will it be for a militia to upgrade systems? The following graph illustrates the new and old costs (in terms of ISK, not LP quantities) for upgrading individual systems. This takes into account the LP/ISK ratios in both the Old and New system and compares the costs across the board. First, until you reach Tier 5, it is more expensive in each Tier to make system upgrades compared to FW 2.0. However, this is not the case at Tier 5. While significantly more LP is required, the actual ISK value of making the upgrade is actually less than FW 2.0. This comes from the fact that the additional LP required in the upgrades at this level does not balance out to supersede the reduction in the value of the LP from FW 2.0 to FW 3.0. Therefore, in terms of the ISK value, it will be cheaper to upgrade the warzone to Tier 5 in FW 3.0 than it was in FW 2.0. For every other upgrade, it will be more expensive. The second thing to note is the actual curve of the graph. The curve of old prices spiked rapidly the higher Tiers you reached. However, the curve of the new prices steadily rises across all Tiers. Ultimately, in terms of the relationship between the four Tiers, and not on the quantities themselves, the old system had a much steeper slope of diminishing returns than the new system. It is cheaper to upgrade to Tier 5 in FW 3.0 than FW 2.0. For the rest of the Tiers, upgrading is made more expensive across the board, but the rate at which diminishing returns are seen as you progress across Tiers has decreased. In addition to increasing the LP costs of upgrades, CCP Ytterbium has proposed to reduce the amount of LP that is taken from the I-HUB, so that upgrades and Warzone Control is maintained for longer periods. This amount will be reduced to 10% of the payout for the plex. Interestingly, this raises a question as to whether the percentage will be taken from the baseline payout, or the actual payout, since the actual payouts will now be shifting based on what Tier you have. Ytterbium's numbers seem to indicate it will be based on the baseline, so we will assume that here. Note that to complete degrade a system down to 0 upgrades, it will take contesting the system from 0 to 99% (assuming no defensive measures are taken) to remove the upgrades. If you wish to degrade a system from a maxed out I-HUB to Upgrade 4, it will take over 57 plexes on average, or around 38% of the systems contestation level. To degrade a militia with 65 systems from Tier 5 (with maxed I-HUBs) to Tier 4, it will take over 142 raw plexing hours, minimum, assuming that the defending militia does not resupply their I-HUBS. Since we donate to the I-HUB from a portion of what we earn, it's important to see the relationship between I-HUB degradation and earnings. Part of the 'point' of many of these changes is to make it much harder for a hostile militia to degrade the upgrades (and thus the Warzone Control Tier) in the other militia's space. But, with an increase in LP income, and a decrease in plex bleed rates, what kind of numbers are we actually looking at? The following chart shows both the multiplier it would take as far as plexing effort to counter full plexing LP donations, and the required percentage of LP that would need to be donated to maintain a Tier at equal plexing rates. This means that if a militia has Tier 4, and was donating 100% of its plexing LP into the IHUBs, that the opposing militia would need to plex 25 times more than them to begin degrading the system even a little. Assuming both militias are plexing at equal rates, a Tier 4 militia will need to only donate an average of 4% of its plexing income to counter the equal plexing degradation bleed rate. Percentages do not take into consideration mission income, or pvp income and is indicative of plexing income percentages only in comparison with counter plexing measures. Now, to compare plexing incomes within a militia, you can take a point on each curve based on the Tier combination. For example, if one militia has Tier 4, the other could have a max of Tier 2. 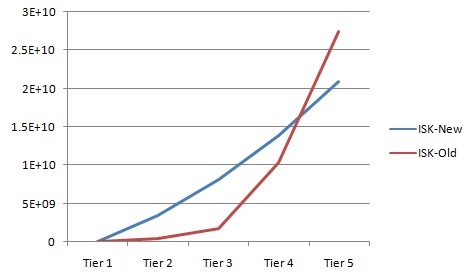 According to the graph, if one militia is at Tier 3, Tier 4, or Tier 5, and the second militia is at Tier 1, the first militia will make more on defensive plexing then the Tier 1 militia will make on offensive plexing. In fact, in every combination of Tiers except for Tier 3/3, the higher Tiered militia will make more ISK per hour defensive plexing then the lower Tiered militia will make on offensive plexing. That is, as I said, assuming that payout bonuses for plexing applies to defensive plexing as well as offensive plexing. If defensive plexing is not affected by Tier bonuses, then defensive plexing for Tier 3,4,and 5 will be somewhat equal to ISK per hour offensively plexing at Tier 1. I am trying to give a more mathematical picture of what some of the changes mean for FW 3.0, and how they will affect various aspects of income, plexing rates, and etc. With the new bleed rates, it's massively harder for a militia to plex down an opposing militia's Warzone Control Tiers. In fact, considering the factors, it will no longer be a reasonable strategy. Is this going from one extreme to the other a healthy thing for the warzone? The new payout system removes a lot of the financial consequences of lower Tiers. Even having Tier 2 makes significantly better ISK per Hour then other activities in the game. Will this make people more passive about taking more sovereignty? Will this nerf the conflict drivers within aspects of sovereignty and Warzone Control and make pvp in FW even more stale? What do these mathematical changes mean for an underdog? It is true that lower Tiers will now have massively larger incomes. However, incentives for defensive plexing is being introduced, and it will be next to impossible for an underdog militia to plex down the opposing militia's Tiers. Does this give higher Tiered militia's more of an advantage? Or is the difficulty increase across all Tiers reasonable? Does this make it more valuable for an underdog to take a system since they will be able to maintain their own upgrades much more easily? Are there really diminishing returns in this new system? With defensive plexing encouraging more defense of higher contested systems, could LP for defensive plexing be seen as a new conflict driver that encourages plexers into more 'hot' zones? Or will the huge buff to lower Warzone Control Tier incomes in conjunction with this make warzones 'stabilize' at middle tiers for the general profit of everyone? Should the overall incomes of Faction War pilots be nerfed even more than what is being suggested? Why, or why not? How does the income for each Warzone Control Tier balance with respect to the risks involved for that Tier? Really, really outstanding work on the number crunching. At first glance, I'll say this: I wouldn't want to go into 3.0 as a Tier 1 underdog. Speaking as Minmatar militia member with no alts anywhere else, it just seems like murder for the Amarr. Also at first glance, it seems like the iHub bleed is being reduced too much. 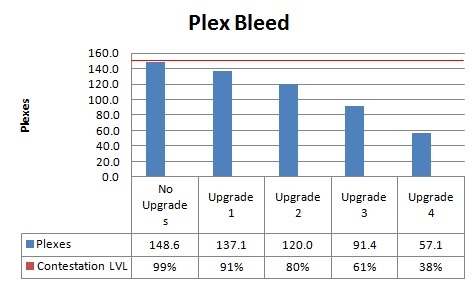 I see what they're aiming at, but between the bleed being moved to 10% and the increased incentive to d-plex... yeah, that's rough. FW right now pays out too much at the high end. It's not good for the economy and it's not good for Eve. Making billions of isk with a skilless alt brings people into FW that abuse the system and bring no content with them. The changes promise to chase a good number of them out. They also promise to end Amarr pilots of all people creating Minmatar alts to cash in on the 'spikes'. For that I'm thankful too. The increased income at the low end was needed to taper in the metagaming as well. Amarr as well have suffered a null-sec style failcascade. That may be acceptable in many people's eyes - however the only route to rebuild Amarr would be for many in the Minmatar militia to get bored and leave - creating an opening for new pilots to enter. That's alot of down time. Lastly - I'd like to add some scarcity to LP. Detach the missions from the LP multiplier. A losing side could rely on them more (and we can entertain higher tier penalties) and the winning side wouldn't abuse them. I'm also a big believer in making caldari plexes pay Gallente LP and not Minmatar. If you have to rely on three Amarr systems for offensive LP and defensive LP for the rest of your upkeep - it makes a much harder equation to keep that Tier V. And the seesaw can swing a little faster too. Comment removed. Please do not post links to outside websites. I didn't check your math but its similiar to the numbers I would figure eyeballing it. Thank you for putting this out there. So we will have no big surprises after these changes come out. You say you are not an expert in psychology but I don't think you really need to be, to see what will happen unless they do something to balance things. Your numbers pretty plainly spell out what any rational player should do: Join the winning side. Want to defensive plex? You will make more isk if you join the winning side. Want to offensive plex? You will make more isk if you join the winning side. You will even likely make more isk defensive plexing than your opponents offensive plexing if you...Join the winning side. Are we to pretend we don't know what eve players will do? I would love to hear from hans or some other ccp member as to why they think anyone would plex for the side that is losing on this system.